CBJ Fly Patton was adopted by Stephanie, Hannah and Grant who live in Anderson. They are keeping his call name of Patton. He met one of their two cats,(Simba and Sookie) who let him know immediately who was going to be in charge! Patton is fine with that and continued exploring his forever home. The steps were a bit of a challenge, but everyone helped him get thru the trama. He'll be going up and down in a couple days with no assistance. 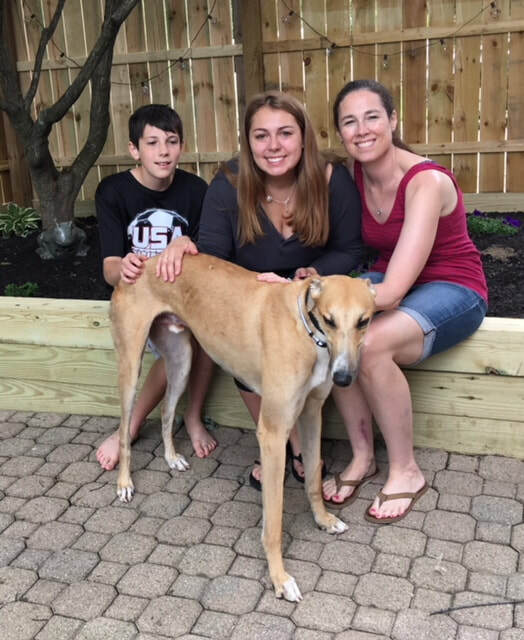 Hannah is who REALLY wanted to adopt a greyhound, but everyone was thrilled to make him a new family member, he will be loved.